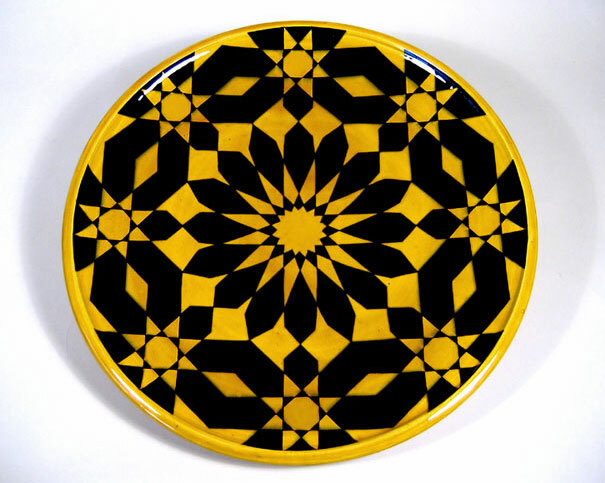 This pattern also uses the famous Solomon's seal, which is the eight pointed star made of two squares that interlock at a 45-degree angle. According to legend, this was the symbol on King Solomon's ring. Inscribed within the seal is a 16 pointed star. The outer border has two really thick lines that intersect with each other to create eight small eight pointed stars, within which are smaller Solomon's seals. I love the way the central Solomon's Seal is almost completely obscured by the complexity of the design. If you look closely, suddenly it will spring in to view. The little seals are kind of hidden too, by the eight pointed stars.